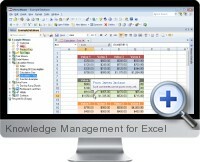 Knowledge Management for Excel (MemoMaster) is an application that collects and organizes metadata from multiple sources and file formats, including Excel, for the efficient management and sharing of knowledge. The knowledge management system collects and allows the administration of all types of texts, images and calculations within documents. The resulting metadata is structured and categorized into folders and sub folders. The vast amount of collected metadata from multiple document formats and sources can then be used as a knowledge base for efficient process management. Information stored within the knowledge base such as descriptions, calculations, forms and links can be edited using a familiar work processing environment and spreadsheet functions. Use with Excel documents or all document types on a computer or a network. Share and collaborate to organize knowledge and achieve process efficiencies across and organization. Edit Texts with known word processing and spreadsheet functions. Search all metadata with matches numbered and highlighted. Administer knowledge and categories in a tree structure. Link content and categories and assign tasks or Outlook appointments. Tag and highlight knowledge content. Undo and redo editing processes. Link Microsoft Word documents or Excel tables directly. Transfer information directly to Excel or Word without export processes. Create encrypted and protected PDF documents. Insert tables, form fields, graphics, text and borders into memo content. Execute cell calculations with 100 Excel compatible formulas. Save and reuse metadata as textual templates. Create web, email, file and folder links within and across content. Print, export and import contents with a table of contents created. Save knowledge content as memo, Word, Excel, text, HTML, PDF or as attachments. Manage and organize favorites for important information. Embed Screenshots into metadata content. Make text references with an integrated thesaurus or via Google and Wikipedia. Work within a team or across an organization.